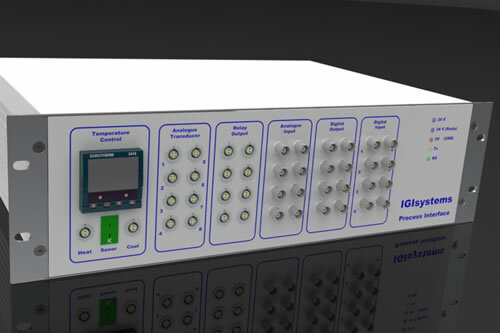 As simple to use as the dIGIbox and other IGI digital flow interface products for use with Brooks Instrument digital mass flow products, the Process Interface is the complete plug-and-play, out-of-the-box solution for your experimental or R&D flow process application. In conjunction with the IGI "LAB Interface" control/automation software and a single USB connection to your Windows PC your system will be up and running in minutes. The Process Interface is designed to control "gas flow systems" which require more than just a flow control interface. Additional inputs are provided to quickly hook-up pressure transducers (provides 24V DC power and reads analogue signal) and solenoid valves, acquire analogue level signals and provide digital (TTL/custom level) I/O. The Process Interface can be supplied with one or more built-in temperature controllers with heat and cool output.